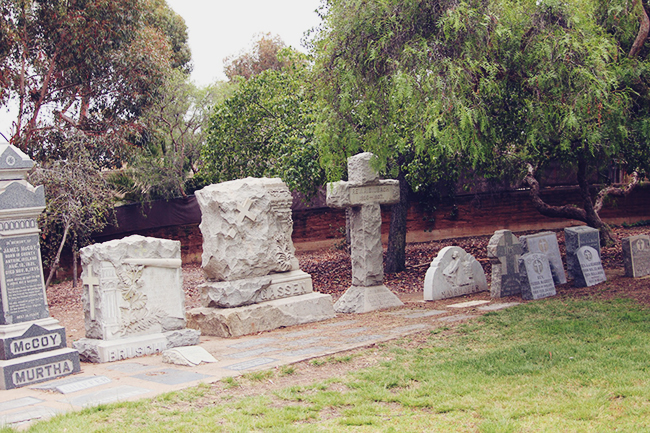 Not to seem like a weirdo or anything but I've always been drawn to cemeteries. (Definitely made sure to take advantage of the Cinespia screenings this summer.) I can't get over the beauty of the structures and its tranquility, so guess how excited I was to come across this gem during my San Diego trip. Also pretty stoked about the transition to Fall so I can swap my chiffons for knits. Kidding. It's 80 degrees in LA. Hope those of you who experience real seasons are enjoying experimenting with layers! Gorgeous photos! The poncho and hat are lovely! love watching movies at cemeteries! is that weird ? This is awesome!! Love your style. Well, I have this weird things for cemeteries too! 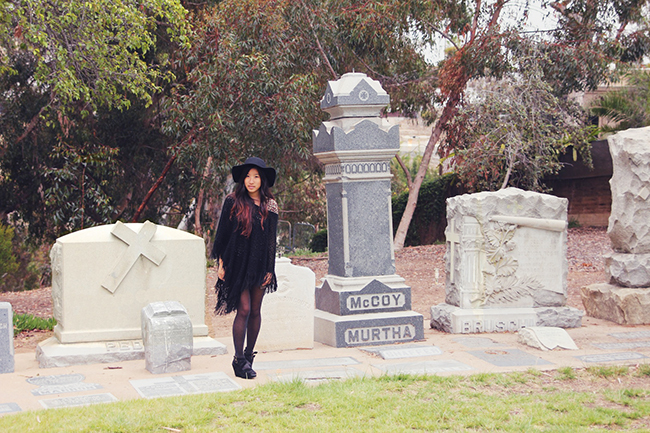 love the cemetery backdrop for these photos. you look gorgeous and chic as well, love the poncho and hat! 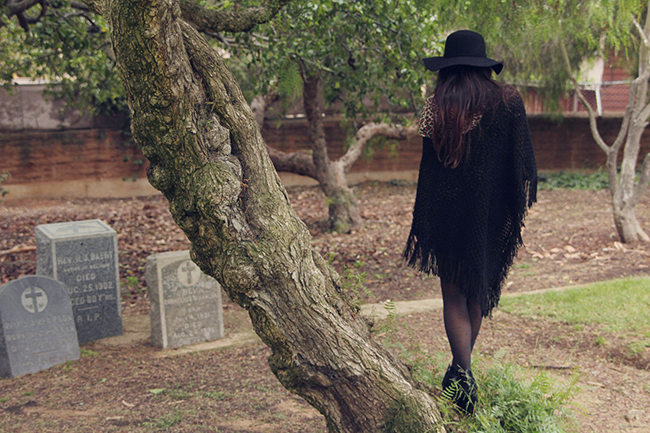 I absolutely adore this outfit, and I have to agree - there's something so tranquil and mystical about cemeteries - I think they're such beautiful places! These pictures are gorgeous :) There's a new post up on my blog and I'd love to hear what you think of it, so feel free to stop by! wow these photos are soooo cool! love your style! Great outfit! I love these photos. Really love your style ! You have a new follower know!! Hope you like too my blog! You look SO gorgeous! I love your entire outfit and the hat is the perfect accessory! Awesome look, dear! Perfect style! And very cute blog! Que look tan bonito!!!! las fotos son muy buenas. This is absolutely fab!!! I really love the whole thing! you are definitely a stunner! Re : thank you for your comment on my blog, you’re super sweet! yes cemeteries are creepily calm ! I love this post. You are morbid, just like I am!! Thanks for dropping by and leaving a comment. Wanna follow each other? As creepy as they might be ..cementeries are great places to shooT!! yay, i just love this look! it's definitely my favourite one of all your looks ! the scenery is awesome but i love every little piece of your outfit <3 it's just more than perfect <3 and i see you use diana!<3 yay! i love the bit of leopard peeking through! yay.... great idea! your outfit is great! Your hair is so pretty! And love that cardi. I need your hat, it’s gorgeous! Amazing shots. love your outfit. you look so stunning! following your blog now. mind to follow back? I love love love that fridge poncho! And that hat is perfect with it. You look stunning! love the hat! wish I had one like that! The fringes are so fun and I LOVE the polka dot tights! Im intrigued by the location n ur fab clothes. n its jus two days away for Margiela H&M :) check me out soon. your pictures are always so good! cute! Cool look! And you have lovely hair! Amazing photos! Love the poncho! Tssss you make me dream! great outfit - love the hat! Yes, the fringe is lovely! I need more in my life! The pictures are lovely and I applaud you of having the guts to take pictures & visit a cemetery since i'm a scaredy cat!! I also love your black on black outfit, you look great!